Several decades ago Bob Hummer invented a new principle which caused a short-lived stir among cardicians. The effect was called "The Mindreader’s Dream". It sounds too good to be true: A spectator merely thinks of a card and performs a few, unseen dealing procedures with a deck of cards. The magician briefly scans the cards, consults a “dream book,” and then names the mentally selected card. Racherbaumer collects in this ebook several improvements and variations on this basic principle, including the original Hummer method. 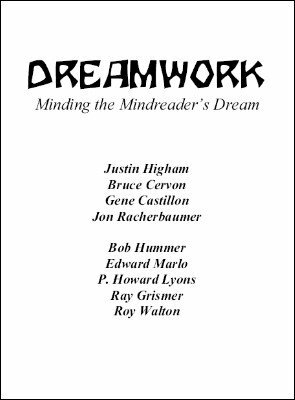 The contributors are an eclectic group of specialists including Justin Higham, Bruce Cervon, Gene Castillon, Edward Marlo, P. Howard Lyons, Ray Grismer, Roy Walton and of course Racherbaumer himself. 1st edition 2008; 23 pages.